The park district is planning to put Measure CC on the ballot for renewal next year. It’s time to look at how the park district spent our tax dollars and decide if we want to continue to give them our tax dollars for another 15 years. If you want Measure CC funding to be used differently, now is the time to tell East Bay Regional Park District what you want…BEFORE the ballot measure is written. Fuels Management vs. Resource Management? The park district budgeted $10.2 million of Measure CC funding for “fuels management,” about 22% of the total available funding from Measure CC. To date, the park district has appropriated $8.8 million of that budget allocation and spent $6.3 million. There is no evidence that native plants and trees are less flammable than non-native plants and trees. In fact, available evidence suggests that native landscapes in California are highly flammable. 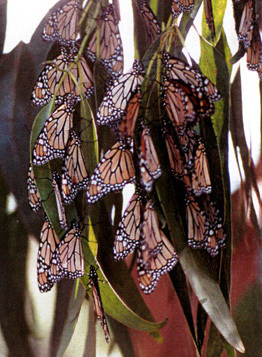 Most monarchs in California spend the winter months roosting in eucalyptus trees. These trees are being destroyed in East Bay parks where monarchs have roosted in the past, such as Point Pinole. There is no evidence that destroying non-native trees will “enhance wildlife habitat.” In fact, wildlife habitat is being destroyed by “fuels management” projects. The destruction of non-native trees is also controversial because the stumps of the trees and shrubs that are cut down must be sprayed with herbicide to prevent them from resprouting. The park district used an average of 26 gallons of Garlon each year from 2000 to 2015 and 39 gallons in 2016, for that purpose. 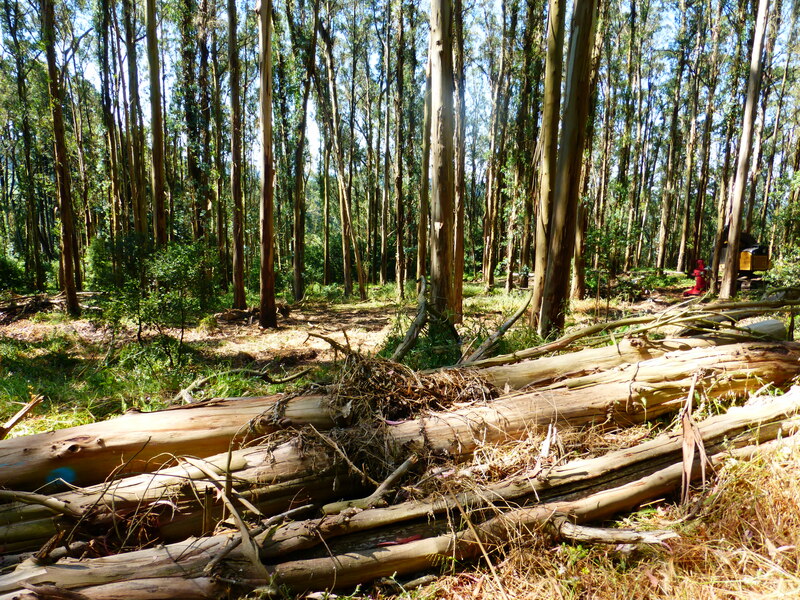 There is a wide range of opinions about the tree removals that the park district has done since their program began in 2011, after approval of the “Wildfire Hazard Reduction and Resource Management Plan” and the associated Environmental Impact Report. At one extreme, some people want the park district to destroy ALL non-native trees on its property. They consider “thinning” inadequate. The Sierra Club is in that camp and has sued to enforce their wishes. At the other extreme, some people don’t want any trees to be removed, although most would make an exception for dead and hazardous trees. After observing the park district’s tree removal projects, I have reached the conclusion that they represent a middle ground that I can accept because in many cases the canopy is intact and the forest floor is still shaded. The shade retains the moisture that retards fire ignition as well as suppresses the growth of weeds that ignite more easily during the dry season. In the 20+ years that I have defended our urban forest, I was always willing to accept a compromise and the park district’s methods look like a compromise to me. I still have concerns about tree removals and they are explained HERE. You must reach your own conclusions. Unfortunately, coming to terms with the park district’s tree removals has not resolved my misgivings about how Measure CC money has been used. In a nutshell, I believe that the park district’s “resource management” projects are based on outdated conservation practices. I believe the park district is trying to re-create historic landscapes that are no longer adapted to environmental conditions. Their projects are often not successful because they do not take the reality of climate change into consideration, nor do they look to the future of our environment. They are stuck in the past. One of the projects funded by Measure CC is typical: the effort to eradicate non-native spartina marsh grass from all park properties. The park district has been participating in the effort to eradicate all non-native spartina marsh grass from the entire West Coast for 14 years. In the first few years, EBPRD aerial sprayed from helicopters several hundred gallons of herbicide per year. Now the quantity of herbicide is about 25 gallons per year. 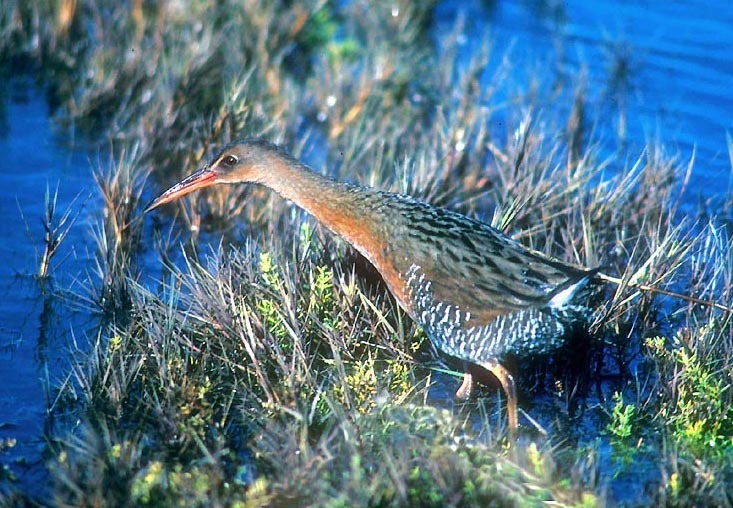 We have known for several years that the eradication of non-native spartina has decimated the population of endangered California rails. In 2016, a paper was published in a peer reviewed scientific journal about the huge declines in the rail population that were caused by the eradication of spartina. The reason why the rails have been harmed by the eradication of their habitat is that non-native spartina provides superior cover for the rail. The non-native species of spartina grows taller, more densely, and it doesn’t die back in the winter as the native species of spartina does. When the rail begins its nesting season, there is no cover for the birds. They are therefore being killed by their many predators. The fact that non-native spartina provides superior cover for the birds is related to a second issue. Non-native spartina provides superior protection from winter storm surges compared to the native species which provides no protection, even when it grows and it is NOT growing. The US Geological Survey recently reported that sea level on the Coast of California is predicted to rise as much as 10 feet in just 70 years. USGS predicted that 67% of Southern California’s beaches are expected to be lost by the end of the century. Marsh grass for coastal protection is more important than ever. The third issue is that eradicating non-native spartina has not resulted in the return of native spartina. Even when extensive planting has been done, native spartina does not provide habitat or storm surge protection in the San Francisco Bay Area. We should be asking if pouring hundreds of gallons of herbicide on the ground might be a factor in the unsuccessful attempt to bring native spartina back to the Bay Area. The spartina eradication project is an example of conservation that no longer makes sense. It damages the environment with herbicides. It destroys the habitat of rare birds. It exposes our shoreline to strong storm surges and rising sea levels. Native vegetation does not return when it is eradicated. The parks are very important to me. I visit them often and I treasure those visits. I would like to vote for Measure CC. I hope that the measure on the ballot will give me a reason to vote for it. I will be looking for a revised definition of “resource management” in the ballot measure, one that acknowledges that climate change is the environmental issue of our time and that conservation must be consistent with the changes that have already occurred, as well as look forward to the changes that are anticipated in the future. Specifically, “resource management” must respect the landscape we have now, which means not trying to eradicate it, particularly by spraying it with herbicides. Resource management projects must be based on reality, rather than on fantasies about the past. EBRPD asks that the public RSVP by sending an email to Monique Salas at msalas@ebparks.org or call 510-544-2008. If you can’t attend, please send written feedback here: publicinformation@ebparks.org. Please tell East Bay Regional Park District what you want Measure CC funding to pay for. I voted for measure CC last time around. Then I discovered the details of what ‘fuel management” entailed. I never would have voted to fund this campaign to remove eucalyptus trees and then apply pesticides for years. I’m really mad about the deception and really not sure I’d support a renewal, even though I love the parks and wish I could support the renewal of CC. It depends on some details. I’d like to see an explicit commitment by EBRP to PLANT trees. I want a robust reforestation project, with appropriate trees, native or not, but trees that will survive a changing climate and probably not Oak or Laurel. (Sudden Oak Death). I want a species neutral approach to fire management that removes only dead or dangerous trees within 200 ft of buildings. Thinning forest areas far from houses is a waste of money–money that would be better spent on planting trees. I’m also looking for them to abandon the eradication of spartina grass. Thank you for yet another wonderful post. The deception and harm to our forests is terrifying. I so appreciate this site that I can share when meeting people who care about out environment. And I appreciate your in-depth information about why so much of our natural area should be left alone, from the spartina to the trees. I fear any compromise ends up leading to the tree-killers/poisoners winning though. I agree the thinned forest is better than none, but still will be more flammable in terms of dryness and wind access to spread fire. But really, at this point, I do not believe anything our local agencies say about fire prevention or anything else. If they really cared, they (EBRPD, EBMUD, CalTrans, PG&E, cities, etc.) would not continue to leave enormous piles of branches, tinder, and wood in so many locations. It’s astounding. People recently objected about a PG&E location in Oakland where there were two huge transformers over piles of logs, woodshavings, and more logs on trucks full of fuel. Once reported to the media, it was immediately cleaned up. But this is happening all over. I’m increasingly seeing clear-cutting on private land in the Oakland hills, leaving stumps on almost vertical areas, right below houses and other buildings. At this point, what remains of the roots and some broom struggling to grow are still holding the hillsides together, but it will be a sight to see when the rains really start. I would not be surprised if the city recommended the tree cutting. Most upsetting about Measure CC is that most people will vote for the opposite of what they want, which is that instead of our parks and forests being protected, they will kill and poison more trees. Thank you for helping make the truth public.